Fresh names to Visionquest, but certainly not new to the game; More Than Material is the promising new project between two bonafide French selector statesmen who collectively boast decades of dancefloor and studio science:Jedsa Soundorom and Gauthier DM. Launching their new alias earlier this year on Zingiber Audio, their signature has been tangible from the off; deep weighted grooves, warm dynamics and total immersion. 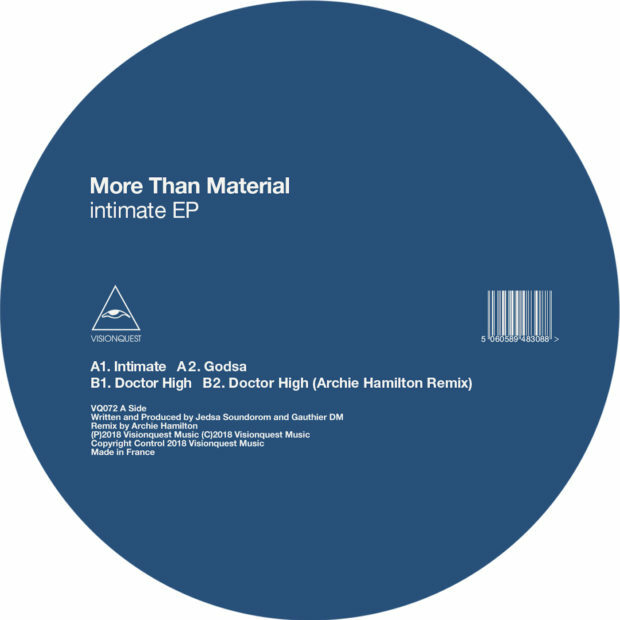 ‘Intimate’ says it all; realising its title’s close connotations with a dubby, physical groove and a rollcall of soul rolling elements, it’s the sound of a crowd locking in en- mass. Low ceiling, heads down, lights low. ‘Godsa’ follows with similar moody momentum and another hypnotic weave. This time over much more of a stately techno noir soundscape as its persistent jack is laced with subtle acid details. Next, we hit ‘Doctor High’, an ageless deep house groove peppered with nuances of uplift, trippiness and a drum arrangement that taps deep into the foundations. Once again, the track relives its title’s implications. Finally, we sign out with a precision revision from Fuse resident Archie Hamilton who refixes the pace and density of ‘Doctor High’ with more of a driving peaktime aesthetic that remains fully respectful of the original’s weight and clarity. More Than Material by nature, spirit and name.